Book cover design completed by Gordon Kessler. Check out his e-pub services. Nelly has taken in a neighbor’s twins after their parents were victims of a grudge-murder by outlaws. Now the killers have come for the children. Nelly is terrified but has vowed the outlaws will have to take the children over her dead body. The following is the rest of the scene. “How you gonna stop us, half-pint?” the leader asked with a wide grin. He wore a black shirt with a red handkerchief tied around his neck. Pushing the brim of his hat back, he eyed her up and down. “What a pretty package to have such a big mouth. Ain’t she got a big mouth?” He turned to grin at his men. The whiskered man beside the leader had hard eyes and a cruel mouth that twitched at the corner. “Bring ’em out, lady, or we’re gonna go in an’ get ’em. With or without your say.” He leaned on his pommel and spat tobacco juice to one side. “Over my dead body,” she said and lifted her chin higher. Her blood hammered through her veins. They would kill her. Oh sweet Jesus. Give me courage. She trembled, wanting to turn and run, but her feet wouldn’t obey. Their eyes locked. She stared at him defiantly. He squinted, lifting his brow. His three cohorts drew their guns. Shots hit the ground—whizzing, zinging, ricocheting around her feet—kicking up dirt and debris. Don’t show fear, Nelly, don’t show fear! Dust stung her nostrils, and she felt the beginning of a sneeze develop. Then it happened. She sneezed, several times, and covered her nose with her hand. The shooting stopped. “Well by god, we didn’t make her dance, but we sure as hell made her sneeze,” the man with the red bandana said. He busted into laughter, and the others joined in. They galloped off, the thunder of horses hooves resounding across the land. You can find the e-book here. Author B.J. 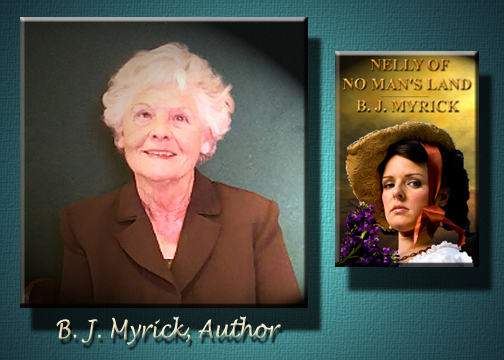 Myrick reveals the research involved in writing her historical novel, “Nelly of No Man’s Land,” which will be available on Amazon Kindle November 30, 2012. Open the door to 1890 and travel with me through the pages of Nelly of No Man’s Land as I share the journey with you. Have you ever wondered where a writer gets the idea for a particular book and what is involved in the creation of the story that looks so enticing in the book’s description? In a series of blog posts this month, I will touch on what is involved in creating a novel while trying to remain faithful to history, move into a character interview, and end with a reading from the novel. I’ll start with the idea for the novel, which was inspired by both my mother’s stories about homesteading in No Man’s Land and my great-grandmother’s recipes for herbal cures—she was a medicine woman. 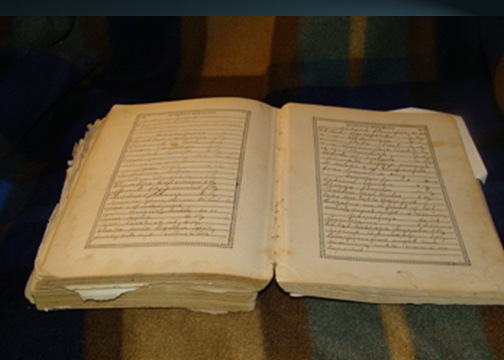 Within the tattered pages of the old Dr. Chase’s book, published sometime in the 1800s, were my great-grandmother’s handwritten recipes for medicines written on the blank pages at the end of chapters. They contained weird ingredients such as sugar of lead, chloroform, sarsaparilla, sulphuric ether and acid, iodide of potash, stillingia, poke root, morphine, to name just a few. Her cures covered diphtheria, blood purifier and liver regulator, piles, worms, and a host of other ailments. With her concoctions, she healed ill and dying patients who had been given up to die by the doctors. Unfortunately, she never passed down the tradition of healing with herbs. As I considered how I could use the herbal healing in a novel, what story I could tell, I remembered all those family stories my mother told me about homesteading in No Man’s Land. As a child, I used to beg her to retell the stories, and she would laugh and say, “Oh, you don’t want to hear that again.” But she always recounted those fascinating tales of digging the dugout, confronting outlaws, and surviving the war between the cattlemen and the settlers. I never tired of hearing about those frightening experiences of what it was like to homestead in that wild and untamed territory. Take a step back in time and travel with me through the pages of Nelly of No Man’s Land as I share the journey with you. The historical novel is scheduled for publication around the first week of December, just in time for Christmas. And read more about B. J. Myrick and her books at amazon.com. Coming soon: In 1889, a pioneer family homesteads in Oklahoma’s No Man’s Land where they struggle to survive in a lawless territory. 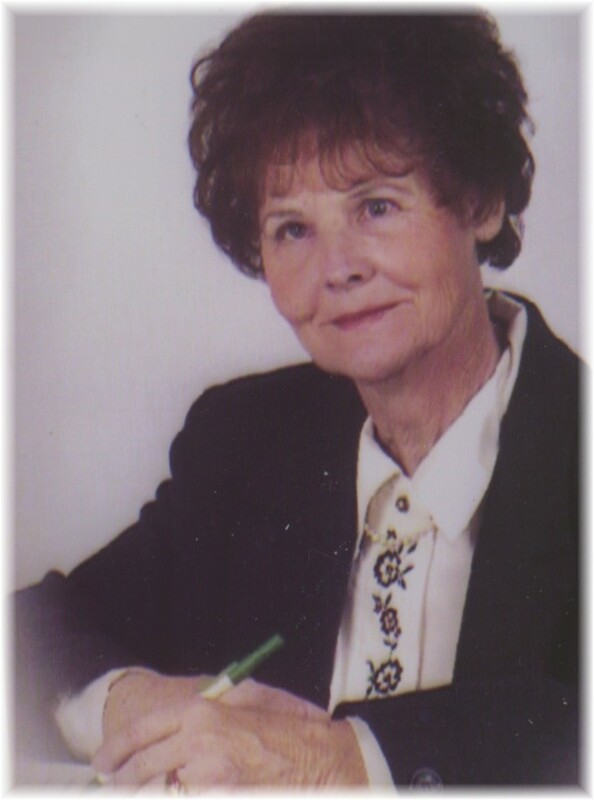 Bonnie Myrick Eaton has won numerous awards for her fiction, and her work has been published online and in local newspapers. She was newsletter editor for the Kansas Writers Association several years. Her novel, Out of Control, is a paranormal suspense, and she partnered up with Hazel Hart to produce two short story collections of dark fiction, Dark Side of the Rainbow, and Edge of Nowhere. 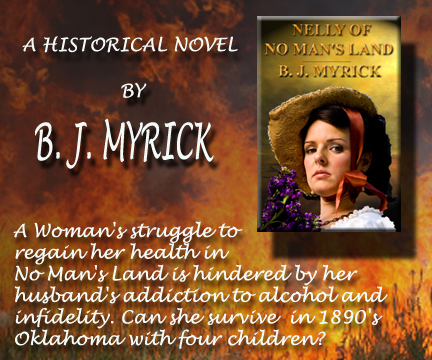 Bonnie newest effort, a historical novel, Nelly of No Man’s Land, is awaiting publication. She is a member of the Kansas Writers Association, Oklahoma Writers Federation, Inc., and the Kansas Author’s Club. She has one daughter and lives in the Midwest. Visit her blog, Keyhole Conversations, at 2tgr.wordpress.com.